The Foundation for Defense of Democracies publishes brief on Daesh antiquity dealing. Heritage for Peace is launching a new website next week. Stay tuned for details. We are currently rebranding, and testing banners, but this is our new look, new logo. A new Crowdfunding program is planned to launch in the New Year. Dr Emma Cunliffe gave a talk on behalf of Isper Sabrine at at the Conflict and Cultural Conference on 31 October on the work of Heritage for Peace. Watch her talk here, and view the full conference here. Rene Teijgeler spoke on ‘Destruction and Protection of Heritage: Iraq and Syria’ at the conference ‘Heritage in Danger in Syria and Iraq’ that took place in The Hague on October 31 2015. HFP Staff are interviewed on WDR Radio here. HFP’s Isper Sabrine is interviewed in the Diaria de Girona on November 9 2015 here. 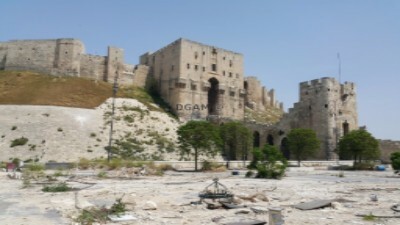 On November 8 2015 the DGAM reported further damage to the Aleppo Citadel, apparently caused by a tunnel bomb. For details, see here. Cypriot authorities are on the lookout for stolen Syrian and Iraqi cultural property, reports Cypriot Education and Culture Minister Costas Kadis on November 6 2015 here. The BBC profiles the work of Christopher Marinello of the Art Recovery Group on November 11 2015 here. In the context of the 38th session of the UNESCO General Conference in Paris, the director of the DGAM, Dr. Abdulkarim, met with the UNESCO DG Irinia Bokova, to discuss the crisis in Syria. See here for details. On November 10 2015, the DGAM in collaboration with the City of Damascus and the University of Damascus held a workshop that documented the historical buildings of the al-Midan district.For more information, see here. On November 7 2015, the head of the DGAM, Maamoun Abdulkarim, made an appeal to the Italian parliament for help protecting Syria’s monuments from further destruction. See coverage from NPR here. He also spoke in France and the UK (see below). On November 14 2015 the International Syria Support Group and its partners met to accelerate planning to find a solution to Syria’s civil war. This included a determination to ‘support and work to implement a nationwide ceasefire in Syria’. See the report here. The Norwegian Institute for Cultural Heritage Research offers 16 recommendations to fight the looting of Syria’s heritage, which can be found here. These are based on the outcomes of their international conference held in September: Fighting the Looting of Syria’s Cultural Heritage. Under instructon from the French Government, the Louvre provides a document outlining fifty propositions for the protection of global heritage. The report is available (in French) here. See also the report on The Guardian on November 20 2015 here. On November 17 2015 President Hollande suggested at the 38th UNESCO conference that endangered Syrian artefacts could be brought to France to be safeguarded. See also the Daily Star report from November 17 2015 here. This is followde up in his propositions. In the closing remarks from the 38th General Conference of UNESCO, held 3-18th November, “the General Conference adopted a Strategy for Reinforcing UNESCO’s Action for the Protection of Culture and the Promotion of Cultural Pluralism in the Event of Armed Conflict, to integrate protecting cultural heritage and diversity into humanitarian interventions in conflict and emergency situations”. According to the Agenda, this was item 4.11: The strategy document, Reinforcement of UNESCO’s Action For The Protection Of Culture and the Promotion of Cultural Pluralism In The Event Of Armed Conflict, is available here. GHF, partnering with the Arab Regional Centre for World Heritage (ARC-WH), the International Centre for the Study of the Preservation and Restoration of Cultural Property (ICCROM), and the International Scientific Committee on Risk Preparedness of ICOMOS (ICOMOS-ICORP) is launching the ‘AMAL in Heritage’ program. This is a rapid impact assessment tool, including database and mapping as well as distance learning. See further details on their website here. The Cultural Emergency Program is a fund for emergencies. Once disaster strikes a site, country or region, GHF will work with our Senior Advisory Board and strategic partners to evaluate the highest priorities for funding after the humanitarian crisis has passed. CEP activities could include rapid impact assessments or comprehensive damage assessments, evacuations of heritage assets (under extreme circumstances), emergency stabilization or conservation measures, or procurement of international experts for assistance to heritage experts on the ground. See here. In November the Foundation for Defense of Democracies released a document entitled “Monumental Fight: Countering the Islamic State’s Antiquities Trafficking.” The 28-page brief examines Daesh, its revenue streams, and places its looting and vandalism activities in a broader context. See the pdf here. The Aleppo Project looks to lessons from Beirut for rebuilding Aleppo in the future (November 24 2015) here. The École Normale Supérieure in Paris held a workshop on November 9 2015 to honour Syrian archaeologists killed protecting Syrian cultural heritage. See here for details. A new online resource from the Antiquities Coalition provides then-and-now pictures of sites damaged or destroyed since the 2011 Arab Spring. See it here. On November 13 2015 the 91th National Congress of the Demeure Historical Association held an event in Paris focusing on the sustainability of ancient heritage. The DGAM Director, Dr. Abdulkarim, spoke about the importance of mankind’s common heritage. For details, see here. On November 12 2015 the World Monuments Fund held an event at the Royal Geographical Society entitled “Heritage and Conflict:” Syria’s Battle to Protect its Past.” The DGAM Director, Dr. Abdulkarim, spoke about the DGAM’s efforts to safeguard Syrian heritage. See here. At least 6 other talks and conferences have also been held to discuss Syrian heritage, and the protection of heritage in the Middle East more generally, including in particular the ASOR general conference, of which the ASOR Cultural Heritage Iinitiative (formerly the Syrian Heritage Initiative but now incuding Iraq) is a part. They are listed on the UK Blue Shield website, who will update their website with further talks, information, podcasts, and outcomes as and when the information becomes available. Applications are welcomed for the eighth annual postgraduate certificate in Art Crime and Cultural Heritage Protection, offered by the Association for Research into Crimes against Art. The closing date for early applications is December 15 2015. See here for details. Report 57-58 for September 2-15 can be found here. Morehsin Allahyari, an Iranian-born artist, was honored at the 10th Florence Biennale for the 3D Modeling project ‘Material Speculation: ISIS’. The project produces 3D models of artefacts destroyed by Daesh. See here. The Huff Post blog on November 4 2015 calls for closure of the ‘artifacts for arms doors’ to cease the funding for Daesh through the sale of stolen cultural property here. The BBC on November 14 2015 asks whether the time has passed to save Syria’s antiquities here. The Interpreter on November 10 2015 considers UNESCO’s position as one of the major players in the struggle to defeat Deash here. ArtNews.com on November 7 2015 offers a detailed examination of the destruction carried out by Daesh here.